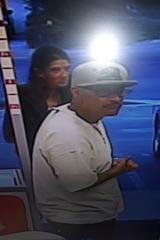 UPDATE: Monday, April 18th - 4:17 p.m.
Detectives are releasing photos of a suspect wanted in connection to the assault/carjacking that occurred on April 16th. The suspect assaulted the victim with a handgun and ran over the victim's leg when he fled the location in the victim's vehicle. The victim’s vehicle is a gray 2009 Nissan Altima, with rear end damage and has not been located at this time. The suspect was described as a Hispanic Male, medium build, with a goatee and glasses. The Hesperia Sheriff’s Station is asking for the public’s help. Anyone with information is urged to contact the Hesperia Station at (760)947-1500. Callers wishing to remain anonymous are urged to call the We-Tip Hotline at 1-800-78-CRIME (27463), or you may leave information on the We-Tip website at www.wetip.com. On Sunday, April 16th at approximately 7:22 p.m., deputies with the Hesperia Sheriff’s Station were dispatched to the 15600 block of Bear Valley Road in regards to a silent panic alarm. Deputies arrived on scene and confirmed that an armed robbery had just occurred, and the victim’s vehicle had been stolen in the process. Through investigation, it was learned that the victim had just exited Royal Liquor and walked to his vehicle. While getting into the driver’s seat of his vehicle the suspect, approached him. The suspect pulled out what appeared to be a black handgun and struck the victim several times, telling the victim to give up his money. The victim attempted to fight back, but the suspect was able to get into the victim's vehicle and drive away. The victim’s vehicle is a gray 2009 Nissan Altima, with rear end damage and has not been located at this time. 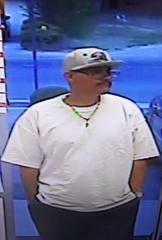 The suspect was described as a Hispanic Male, medium build, with a goatee and glasses.